Gilbert's design included very large display windows at grade level and almost equally large windows with transoms on second and third floors. The building was carried on a steel frame, and the facade on the upper floors featured a spectacular display of American Renaissance-influenced terra cotta made by the American Terra Cotta Company in Illinois. Certain decorative aspects of the building's design were likely influenced by Gilbert's work on the Minnesota State Capitol. Included in the layers of ornamentation were roundels that featured maidens, each one playing a different musical instrument. The inspiration for the roundels likely derived from those designed by Andrea della Robbia for Filippo Brunelleschi's Spedale degli Innocenti in Florence, Italy. The Bowlby Building was the first in a series of buildings with terra-cotta facades designed by Gilbert. 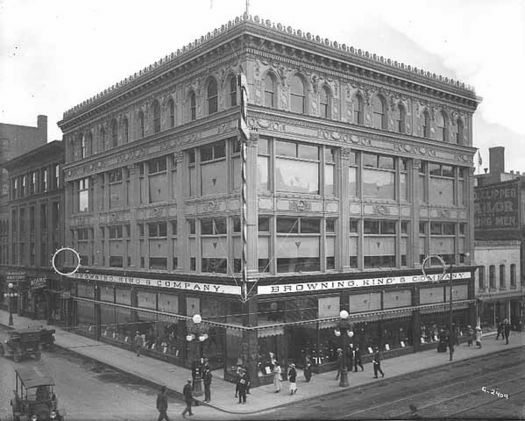 Other Saint Paul examples were the New Endicott Building (1901-1902) and the Essex Building (1905). East Coast examples include the Brazer Building (1896-1897) in Boston, the upper floors of the Broadway-Chambers Building (1899-1900), the West Street Building (1905-1907), and the Woolworth Building (1909-1913), all in New York. The Bowlby Building was razed for urban renewal and the redevelopment of downtown Saint Paul in the 1960s. It may be the most important of Gilbert's buildings that have been demolished.